Author: Shonee Lesh, MS, CGC. I have been a genetic counselor for nearly 20 years. I have done everything from prenatal to adult genetics. No matter which discipline I was working in, family history has always been my number one tool. Your personal and family history can hold clues to the types of health risks you may be at risk for. Therefore, it is important to ask the questions and document the health conditions that run in your family. It is important to know that sometimes the clues are not obvious or are hidden from view. In general, family history is a very powerful tool. For some time now, the world of genetics has discussed the possibility of sequencing a person’s whole genome in order to use this information to better prepare for potential health conditions and perhaps even prevent them. Thanks to Francis Collins, Craig Ventor and many others, we have now sequenced the human genome. However, we have barely scratched the surface as far as understanding what it all means. With the evolution of sequencing technology and bioinformatics, genetic testing as a tool is becoming even more relevant to society. As a Professional Genetic Counselor, I needed to begin learning how to counsel people through sequencing their whole genome and decided to experience it first hand by sequencing my own genome. Before that occurred, I took a full family history on myself. I discovered approximately five hereditary conditions that were present in my family; hemiplegic migraines, hearing loss, celiac disease, hypertrophic cardiomyopathy, and hereditary hemochromatosis. I was, therefore, expecting some of these to potentially show up on my genetic test. 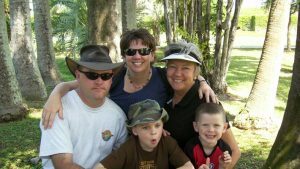 As I sat down with my doctor to review my genetic test results, we found the answer to one of the five hereditary conditions running in my family. I was found to be a carrier of hereditary hemochromatosis. This is a recessive condition, which means if you have two faulty genes for hemochromatosis you may eventually develop high iron levels. I had only one faulty copy, which is unlikely to ever affect my health. We also discovered to our surprise an incidental finding. I am a carrier of MUTYH, a recessive condition resulting in an increased risk to develop colon polyps and colon cancer. I am only a carrier of one faulty copy of this gene. However, people with this condition may have a slightly higher than average risk for colon cancer than those who carry just one faulty copy. According to the guidelines, I should start colonoscopy at age 40 and repeat every year, simple enough. Because these genetic traits are inherited I have warned my family members so that they can have the opportunity to be tested in order to be watchful and to prevent disease. What does this mean for the other four hereditary conditions in my family? Am I off the hook for these? Sadly, the answer is “no”. I must still be watchful for these other issues that run in my family. Why is that you may be asking yourself? The reason is that we do not fully understand the human genome even though we may know its alphabet. It’s possible that I did not inherit some of these conditions that run in my family and that would be great to hear. However, to truly rule out these conditions in myself, some of my affected family members would need to be tested first to make sure the genetic cause can be identified by this test. Until that happens, I will need to continue to be watchful for signs of these conditions and do what I can to prevent disease when possible. As my example shows, both family history and genetic testing matters. Each are powerful tools on their own, but when used in combination, it’s like having a superpower! Author: Jessica Ordonez, MS, CGC. As a genetic counselor, creating a family history is one of my greatest tools for clinical practice. It helps me assess an individual’s risk for a particular genetic condition, establish rapport with my patient, and educate on the features and variability of a genetic condition. For many years, family history was a manual process, where stencils were my primary drawing tool and computer programs and publishing tables were my primary companions for risk assessment. However, as technology positioned itself at the center of our daily routines and work environments, it felt natural to transition my clinical practice towards using electronic tools for family history intake and risk assessment. Trading in my stencil for a mouse involved a learning curve. The various risk assessment programs within an integrated platform required a deeper understanding of how different database fields come together to compile a successful risk assessment. Once I was on the downslope of the learning curve I experienced substantial benefits in my clinical practice while maintaining the core values and principles of family history intake and risk assessment. Instead of building rapport with my patients while gathering family history on paper, I’m able to build rapport while working with patients directly using a computer to display their family history information so that they can confirm the accuracy of the data in an efficient and convenient manner. Users can also track results by selecting from a list of assays from other labs. Gene lists are then auto-populated and can be modified quickly along with result classifications. See a video of tracking test results for non-Ambry labs. The GTR feature also empowers the clinician to use patient test results data when generating letters, querying data or tracking key reporting metrics. Current users should update to Progeny 10.2.2.0 or higher to access these new features and enhancements. DELRAY BEACH, FLA., April 26th, 2017—Progeny Genetics LLC (Progeny), a leading risk modeling pedigree software for clinicians, announced today that Jamie L’Heureux, MS, CGC has been appointed to the role of Chief Executive Officer. For 20 years, Progeny has assisted healthcare providers with patient screening, risk analysis, order processing, clinical review, and letter generation. Ms. L’Heureux brings over 12 years of experience in both research and clinical genetics as a Board Certified genetic counselor. 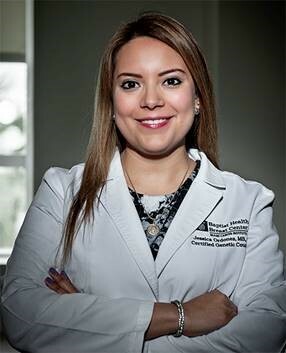 She received her Master’s degree in Medical Genetics from the University of Cincinnati’s Genetic Counseling Training Program and began her career at the University of Iowa as a Research Coordinator for several international research projects. Ms. L’Heureux’s strong background in software development includes implementing new laboratory information management systems and designing patient-facing Family History Questionnaires. 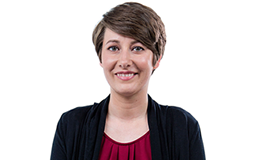 For the past three years, Ms. L’Heureux served as Software Product Manager at Progeny, and was integral to development of Progeny’s letter generation feature and integrated risk models. At Progeny, we want every patient to receive the best possible diagnosis and treatment plan. We also value technology as a way to enhance the collection of family history data by clinicians. In that spirit, we are excited to announce our latest innovation – the creation of an iPad app that gives doctors and clinicians the full Progeny experience while freeing them from being tied to a computer. 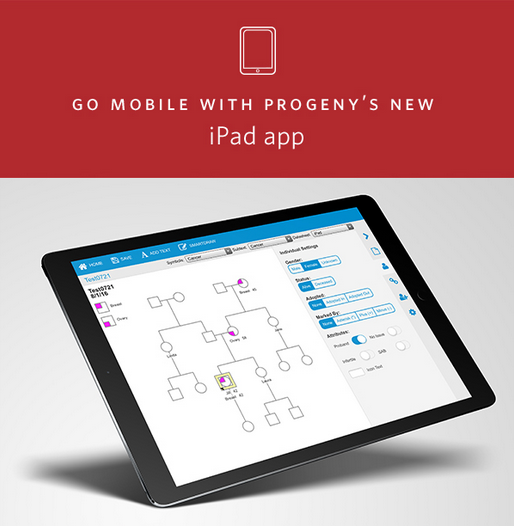 The app enables on-the-go use of the full Progeny experience, with faster, easier pedigree creation and letter generation. The app lets you review family history, create pedigrees and update your pedigrees in real-time from anywhere. In order to experience the app, users must upgrade to Progeny 10.